BOSTON — Scientists routinely seek to reprogram bacteria to produce proteins for drugs, biofuels and more, but they have struggled to get those bugs to follow orders. But a hidden feature of the genetic code, it turns out, could get bugs with the program. The feature controls how much of the desired protein bacteria produce, a team from the Wyss Institute for Biologically Inspired Engineering at Harvard University reported in the September 26 online issue of Science. When rare ‘words’ (codons) are present near the start of bacterial genes, working copies of the gene dont fold as readily into structures that block protein production. To find out whether the rare words themselves or lack of roadblocks increased protein production, Wyss Institute researchers synthesized 14,000 snippets of DNA with rare codons, roadblocks, both, or neither (individual pixels in this diagram), inserted them into genes, and measured how much protein they produced. 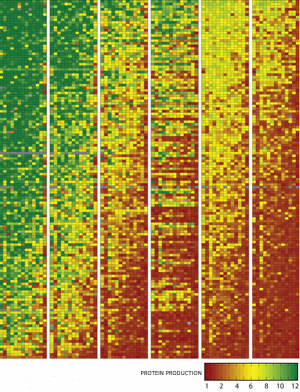 Those with rare codons and roadblocks no longer made more protein (green pixels). That showed that rare codons work by removing roadblocks. In bacteria, as in books, some words are used more often than others, and molecular biologists have noticed over the last few years that rare codons appear more frequently near the start of a gene. What’s more, genes whose opening sequences have more rare codons produce more protein than genes whose opening sequences do not. To see which ideas were correct, the three researchers used a high-speed, multiplexed method that they’d reported in August in The Proceedings of the National Academy of Sciences. First, they tested how well rare codons activate genes by mass-producing 14,000 snippets of DNA with either common or rare codons; splicing them near the start of a gene that makes cells glow green, and inserting each of those hybrid genes into different bacteria. Then they grew those bugs, sorted them into bins based on how intensely they glowed, and sequenced the snippets to look for rare codons. "That’s a big deal for the cell, especially if you want to pump out a lot of the protein you’re making," Goodman said. The results were also consistent with the codon-ramp hypothesis, which predicts that rare codons themselves, rather than folded mRNA, slow protein production. But the researchers also found that the more mRNA folded, the less of the corresponding protein it produced — a result that undermined the hypothesis. To put the hypothesis to a definitive test, the Wyss team made and tested more than 14,000 mRNAs — including some with rare codons that didn’t fold well, and others that folded well but had no rare codons. By quickly measuring protein production from each mRNA and analyzing the results statistically, they could separate the two effects. The work was funded by the Department of Energy, the Office of Naval Research, Agilent Technologies, an NSF Graduate Research Fellowship to Daniel Goodman, and the Wyss Institute. The Wyss Institute for Biologically Inspired Engineering at Harvard University (http://wyss.harvard.edu) uses Nature’s design principles to develop bioinspired materials and devices that will transform medicine and create a more sustainable world. Working as an alliance among Harvard’s Schools of Medicine, Engineering, and Arts & Sciences, and in partnership with Beth Israel Deaconess Medical Center, Brigham and Women’s Hospital, Boston Children’s Hospital, Dana Farber Cancer Institute, Massachusetts General Hospital, the University of Massachusetts Medical School, Spaulding Rehabilitation Hospital, Boston University, Tufts University, and Charité – Universitätsmedizin Berlin, the Institute crosses disciplinary and institutional barriers to engage in high-risk research that leads to transformative technological breakthroughs. By emulating Nature’s principles, Wyss researchers are developing innovative new engineering solutions for healthcare, energy, architecture, robotics, and manufacturing. These technologies are translated into commercial products and therapies through collaborations with clinical investigators, corporate alliances, and new start-ups. The Wyss Institute recently won the prestigious World Technology Network award for innovation in biotechnology.